Where is the Flint Hills? 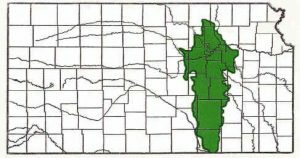 The Flint Hills physiographic region stretches north and south nearly 200 miles through the eastern half of the state. It includes part of 20 counties and covers most of nine. The area is named for the chert or flint rock that covers the slopes. Because these rocky soils discouraged plowing, much of this region remains as native tallgrass prairie. 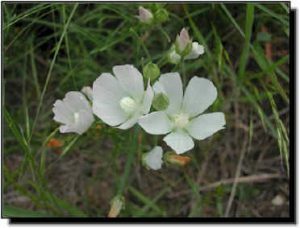 How many wildflowers are in the Flint Hills? Some 1,000 species of flowering plants and ferns are found in the Flint Hills, about half of the total for all of Kansas. 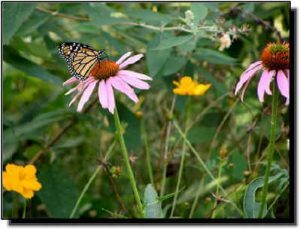 They represent 110 plant families, the largest being the Aster Family with 145 species. Second largest is the Grass Family with approximately 125 species. The Meadow features 61 of these species. With the changing seasons, the panorama of the landscape changes in both color and height. Bloom times shown for each species vary depending on latitude. Plants at the southern end of the Flint Hills will bloom sooner than those nearer Nebraska. The variety of distinctive wildflowers and grasses characterizes this unique ecosystem. It is a high, wide, gently rolling landscape blanketed with the largest continuous area of tallgrass prairie left in the world. Chert (Flint) is a very hard mineral and was prized by the Native American tribes as an ideal material for making arrowheads, spear points and cutting tools. Thepresence of this hard, weather-resistant mineral in the underlying rock formations slowed the process of erosion, leaving this area higher than the surrounding countryside. What makes the Flint Hills special? The Kansas Flint Hills hold the nation’s last remaining expanses of tallgrass prairie. 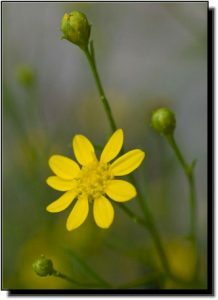 Prairie, a French word meaning "meadow", contains wildflowers and grasses that are not only beautiful but also serve many valuable ecological functions. 7) adding beauty and color to our lives. All of the plants in this guide except Sericea Lespedeza (see page 64) are native, which means they were here prior to European settlement. Since that time numerous plants have been introduced to the Great Plains from other parts of the world. Currently about 21 percent of the species of flowering plants and ferns in Kansas are introduced plants. Some are relatively innocuous, blending into the prairie ecosystem. Others are troublesome invaders, threatening the ecological integrity of the prairie. Grazing and burning are traditions necessary to maintain prairie diversity, but excessive fire or grazing can be detrimental. Invasive species, indiscriminant use of herbicides and habitat fragmentation are the primary threats to Flint Hills native prairies. The prairie is our home. It is the basis of our state’s agricultural and ranching richness. It has much to offer and we still have much to learn about it. Enjoy and protect this irreplaceable legacy. Sedges are perennial herbs often over-looked or mistaken for grasses. They differ from grasses in that “sedges have edges,” which means the stem is triangular in cross-section, usually with three, well-defined edges seen and felt. Grass stems are round. 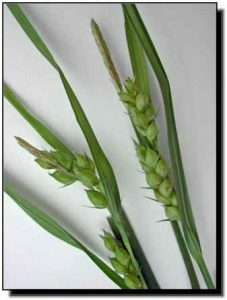 When viewed from above, a sedge plant has three-ranked leaves, each leaf radiating from the stem approximately 120 degrees relative to the leaf below it. Grass leaves are two-ranked, each leaf radiating from the stem on the side opposite the leaf below it. Sedges comprise a large group of interesting and important species. 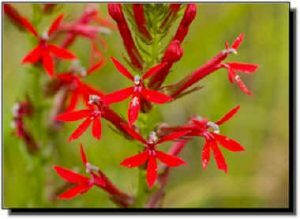 Besides growing along edges of streams and ponds, they can be found in colonies on damp prairie slopes and low moist draws where they often compose a large portion of the vegetation. Sedge fruits, called “achenes,” are valuable food for wildlife, especially ducks and other waterfowl. Plants are used for food and nest materials by beaver and muskrat. Sedge plants are important forage for livestock in native range and as hay. In the spring, deer seek out sedges as food. Spikerush, umbrella sedge and bulrush are other large groups of grasslike plants that belong to the Sedge Family. Some 30 species of Carex occur in the Flint Hills. They are most showy when fruit capsules ripen. A few ripen in early spring, but most mature in June. 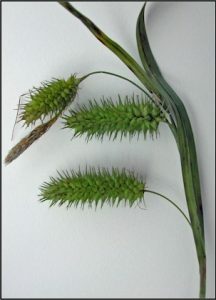 The different fruiting spikes in these photographs reveal the great variety in sedge species. 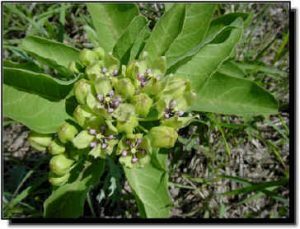 Many plants have been introduced to Kansas since the mid-1800s. 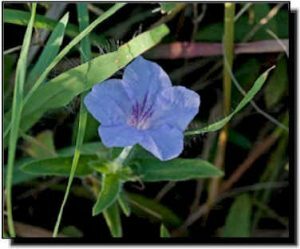 Nearly 21 percent of the wild plant species growing in Kansas are considered introduced. Some of those species are invasive; aggressively competing with native plants, crowding them out and creating a monoculture. 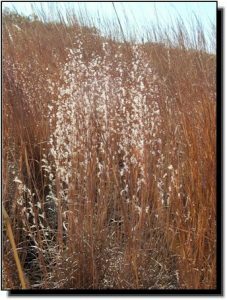 In Kansas, one of the worst is Sericea Lespedeza.